Coleslaw sounds so 1980s. 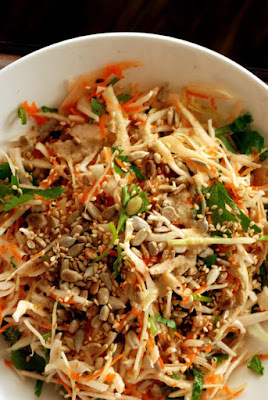 I know it was probably a disservice to rename the Raw Pad Thai as Coleslaw with a Spicy Almond Dressing. I mean, coleslaw? 1. Place cabbage, carrot, green onion and cilantro in a bowl and toss. 2. In a small cup, mix together the sesame oil, lemon juice, agave, tahini, water, zest and salt. 3. Plate salad, top with sesame and sunflower seeds and drizzle with dressing. 0 Response to "Crunchy Cabbage Salad with Orange-Tahini Dressing"